During the month of November, we are collecting toy donations for junior enlisted military families that are part of Military Outreach Ministries. Toys are needed for children ages newborns to 12. Please bring the unwrapped toys to MOM’s table on the plaza every Sunday in November or leave them in the MOM’s toy box in the church office during the week. If you don’t want to shop, donations of cash or checks (made out to PLCPC) are also needed to help buy bicycles and toys for the children. 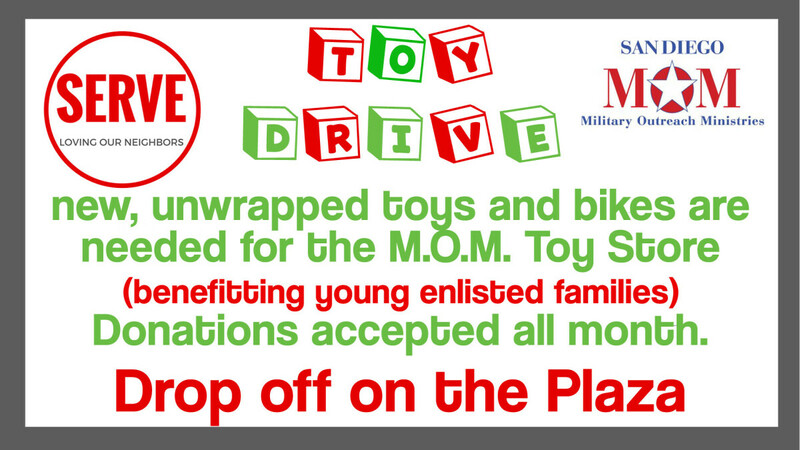 On December 1 there will be a MOM’s toy store in the FLC to distribute toys to the families. If you would like to help with the toy store please see one of the volunteers on the plaza.